Walking at night requires you to think about how you'll light your path, especially in areas without streetlights. You also should use lights simply to be more visible, in addition to reflective gear. Vehicles approaching you from side streets or different angles may not illuminate your reflective gear with their headlights. so wearing lights or strobes can add safety. Small flashing strobe lights can be clipped to your clothing to provide visibility without adding any weight. Look for them in cycling shops or running stores. They usually have a long-lasting battery and can be turned on and off easily. Strobe lights are good for making drivers aware that you are something they need to pay attention to and avoid. Can you see the path ahead of you to avoid holes and tripping hazards? Many walkers use their cell phone flashlight app. If you didn't realize your phone had one, do a quick search and make friends with it. It's very handy, especially if you enter an area without streetlights. But you might prefer to carry a dedicated flashlight as well. Choose one that is lightweight but powerful. LED flashlights can be longer-lasting for battery life or even recharge via USB. Some, such as WALKBRIGHT, are designed with a red light in the back so you are more visible as well. If you use arm motion when you walk, you may prefer a headlamp to a flashlight for steady illumination of your path. There are many varieties. Some, such as the Petzl Tactikka LED headlamp, have a single strap but adjustable angle for the beam. It is lightweight, the batteries last a long time, and the bulbs are nearly unbreakable. Others have a cross strap over the head for better stability. Look for them at outdoor stores. LED hats incorporate lights in front of the hat or the brim, and may also have rear safety lights or a strobe. They are an all-in-one option. You can also find clip-on LED lights to add to your favorite hat. One problem with some designs is that you can't adjust the angle of the beam. Look for a hat that will put the spotlight where you need it so it's illuminating your path rather than the horizon. 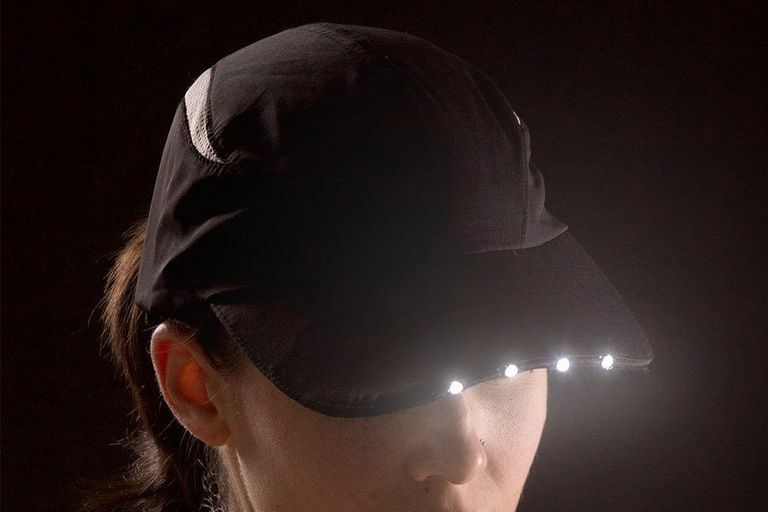 Examples are the Panther Vision PowerCap and the NiteBeams LED Double Vision Running Hat or Visor, which also has red flashers in back and is made of sporty fabric. Be sure to read the instructions on whether you can wash these caps or not before you buy them. For lightweight safety, these are a good choice to put on. You can keep it simple with an armband or ankle band that has an LED light strip or a flashing light. But even better for 360 degrees of safety is a lighted sash or a reflective vest that includes a strip of glowing lights on both the front and the back. You'll be more visible from every angle. Look for these at a running store. The vests are often made in an airy mesh design for comfort when running. They're not just for Halloween or the dance club. Glowing sticks or hoops will set you apart at night. The drawback is that the single-use ones become trash. Plus, they have a limited shelf life so you have to check the expiration date rather than trying to stockpile them. Putting them in the freezer once lit may keep them going for several uses. Better still, look battery-operated glowsticks and dance jewelry, which are popular for using at dance clubs. Remember that you are an unexpected object at night. Crosswalks and driveways: Be sure the driver is aware of your presence by making eye contact before crossing in front of them, especially if they appear ready to turn right on a red light. Use the sidewalks or paths separated from roads. Walking in the road: If there is no sidewalk, be sure to walk on the side facing traffic (this is the left side in North America) so you can see oncoming vehicles. You have the advantage of seeing the headlights of approaching cars. Stay wary and ready to move off the road. If you carry a light, put it on the side that is closest to traffic. US federal data shows that 5000 pedestrians are killed by vehicles each year. They found that most fatalities (69 percent) occur on neighborhood streets. This is a significant public health and safety problem that is killing more Americans than headline-grabbing causes of death such as random gun violence, or the E. coli bacteria. Don't become a statistic, reflect on it and light up for safety. In addition to being more visible to reduce your risk of being hit by a vehicle, also take these stranger danger walking safety precautions. Plus, are you guilty of distracted walking at night?